European mobile speed rankings are in. How does your site compare? Half of all web traffic is now mobile—but according to a recent research report, Europe’s businesses aren’t ready for the rush, or the opportunity. In this article, we’ll look at why slow loading times are a big turn off for your customers, and just some of the steps you can take to get your site up to speed. If there’s one thing most marketers can agree on, it’s that mobile users are all about speed. Whether they’re paying bills, buying products or services or just clicking through to read articles—time is always of the essence, and nobody likes waiting around. A recent research report shows 53% of visits are abandoned if a mobile site takes three seconds or more to load1. And that quickly worsens as page load time increases. For example, if you keep mobile users waiting just 1s to 5s, the probability of them bouncing spikes by 90%. Add just another second, and that figures rises to 106%2. 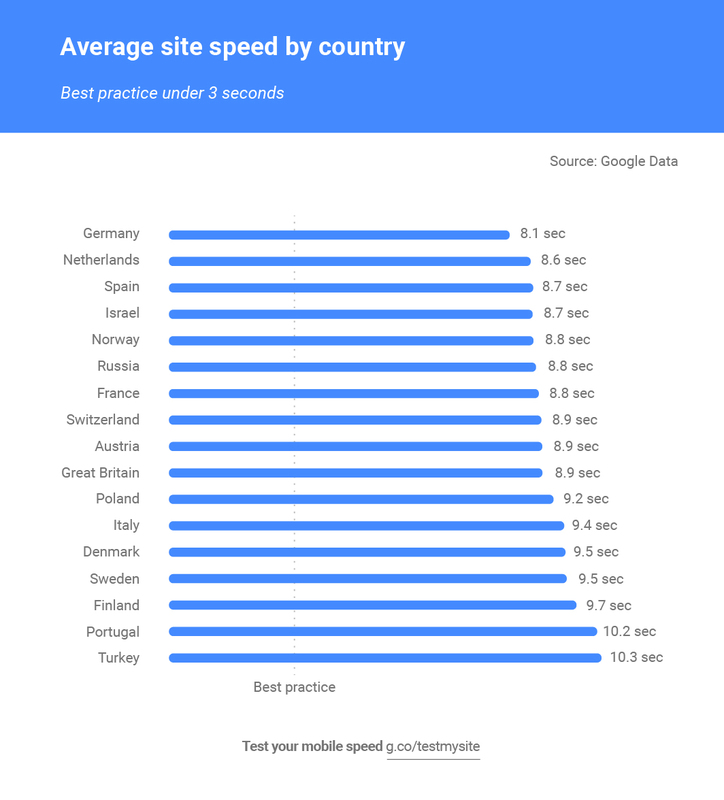 So, given the importance of speed, how do Europe’s mobile sites currently perform? To find out, Google speed-tested mobile ads’ landing pages across 17 European countries and 11 different industries. It showed the average loading time is currently 9.124s —more than 6 seconds slower than the best practice of three seconds. The top performing sites were in Classifieds & Local, with an average landing speed load time of 8.148s; Finance sites at 8.227s; and Education & Government at 8.600s. Perhaps ironically, considering the often impulsive nature of online shopping, Retail sites were the slowest performers—chugging in at 10.290s. This was followed quickly (or not) by Automotive, at 10.259s. Those speeds should be a big wakeup call for European businesses. Yet with almost one in three3 online purchases now occurring on mobile, there are also huge rewards to be had from speeding up—and capitalising on the opportunity. Unpack the essentials first: Prioritise above the fold content over anything else. That way, users consider your site fully loaded earlier on, and can start shopping faster. If you have multiple JS and CSS files, have those load in later on—as users start reading and interacting. Make fewer trips to and from the van: Each resource on your mobile site requires additional requests from the server. So try to group similar files together (eg. JS with JS, CSS with CSS, etc). Small images under 10KB can also be combined into a sprite or web format. Lighter boxes make easier carrying: Large images take longer to load and slow things down. Compress your images to below 100KB wherever possible. GZIP can also reduce the size of text-based resources like CSS or JS by as much as 70-80%. Is your mobile site up to speed? See how well your mobile site performs by using our free Test My Site tool. We’ll also benchmark it against other sites in your industry—and show the business impact you can achieve by making our recommended fixes. Google Data, Global, n=3,700 aggregated, anonymized Google Analytics data from a sample of mWeb sites opted into sharing benchmark data, Mar. 2016.